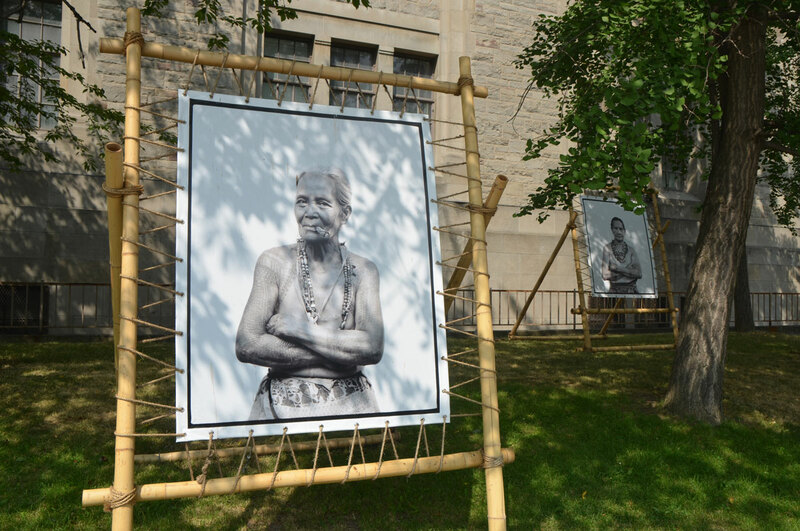 There are seven or eight large photographs, portraits of older women, on University Avenue. They were actually part of the CONTACT Photography Festival and they have been on display outside the Royal Ontario Museum since early May. 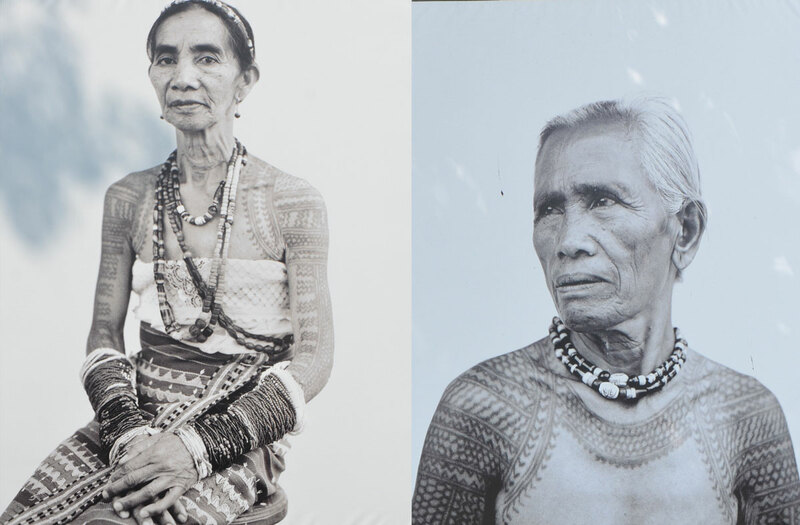 The photos are the ‘The Last Tattooed Women of Kalinga”, portraits by Jake Verzosa. In the villages of the Cordillera mountains of northern Philippines the women have been tattooed with lace-like patterns for centuries. The tattoos are symbols of stature, beauty, wealth and fortitude and are traditionally applied during rituals. The tradition is dying out as standards of beauty change and as the old ways are replaced with more modern methods. Each village once had their own tattooist, or mambabatok, but today only one remains. Born in 1918, Whang-od (or Fhang-od), is the last person to practice the centuries old technique called batok. 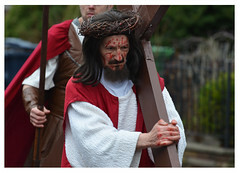 The ink is made of charcoal and water and it is applied by tapping the skin with a thorn. Once the men were also tattooed. The Kalinga tattoo has evolved from their ancient tradition as warriors and headhunters. Heads were taken from fights and battles as a trophy; each time a man brought home a head he would receive another tattoo as a reward. Tattoos were a mark of social status. Indigenous groups throughout the Philippines practiced tattooing for centuries. When the Spanish arrived in the 1500’s they called the people ‘pintados’ or ‘painted people’ as it was not uncommon for people to have tattoos covering their whole body. While some tribes used tattoos to mark status, other tribes believed that tattoos possessed special spiritual or magical powers which gave the individuals strength and protection. The use of tattoos as protective symbols is an idea that occurs in many cultures. 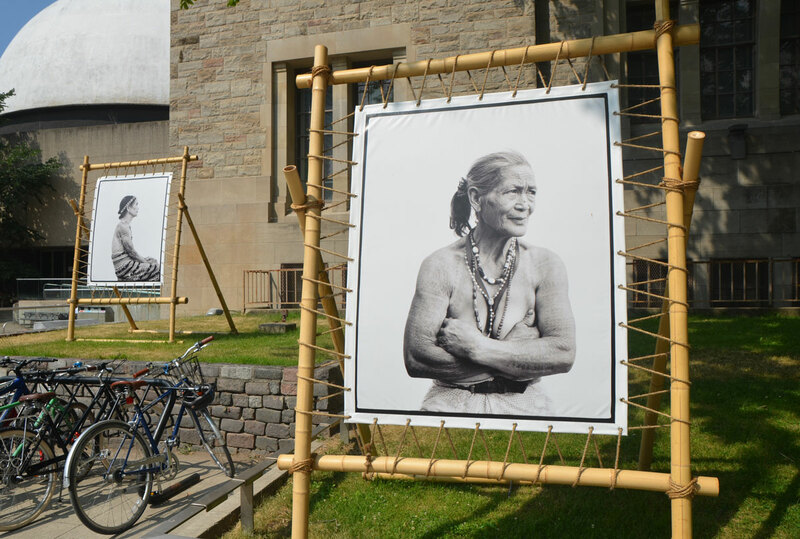 In conjunction with the Kalinga portraits, the ROM is featuring an exhibit that examines the beliefs surrounding tattoos, and the role that they and other forms of body art play in different cultures over the years. 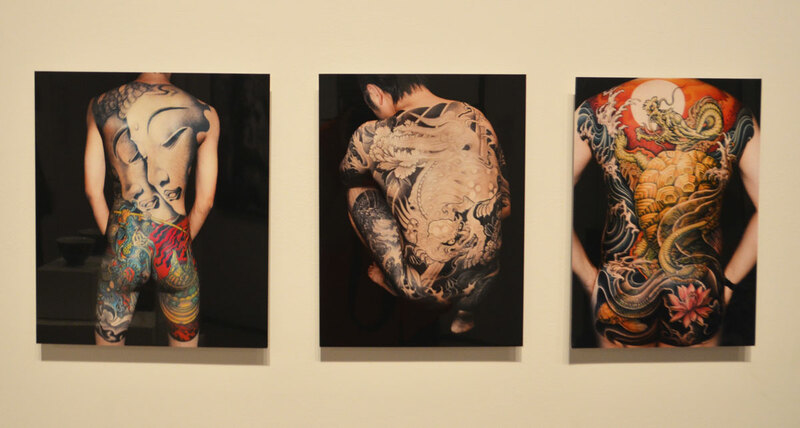 “Tattoos: Ritual, Identity, Obsession, Art” is on view until September 5th. It is a global tour of tattoos past and present. One of the cultures that is featured is the Chinese. For centuries, tattoos were forbidden, or at least taboo, in China. To be tattooed was to be discriminated against as they were associated with prisoners or vagrants. Recently that has begun to change. below: Three large modern picture tattoos by Taiwanese tattoo artist Gao Bin featuring traditional Chinese images, Buddha, lion and dragon. Tattoos as a cultural expression. In some countries such as Sri Lanka and Thailand images of Buddha are considered sacred objects of worship. While it’s not illegal to have such a tattoo, wearing one could get you into trouble. below: Here is another example of why people get the tattoos that they do. This is a picture of one photograph in a series by Isabel Munoz. 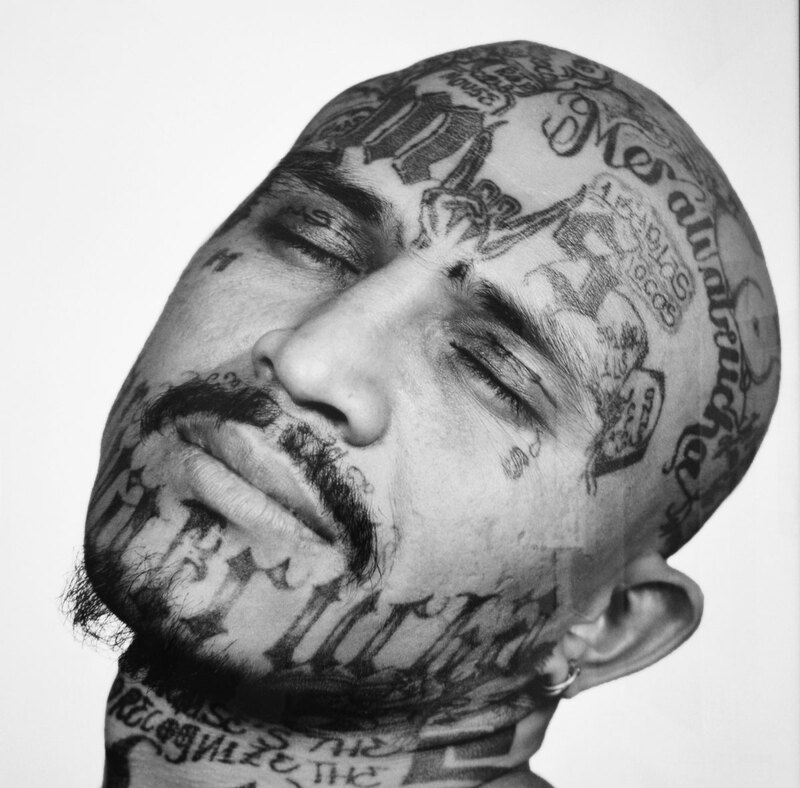 Munoz spent three weeks inside several prisons in El Salvador and photographed mara gangs. 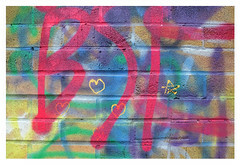 Gang members wear offensive tattoos to assert their antisocial behaviour and express their loyalty to the gangs. Tattoos as statement; tattoos as a mark of membership and belonging. Tribal. 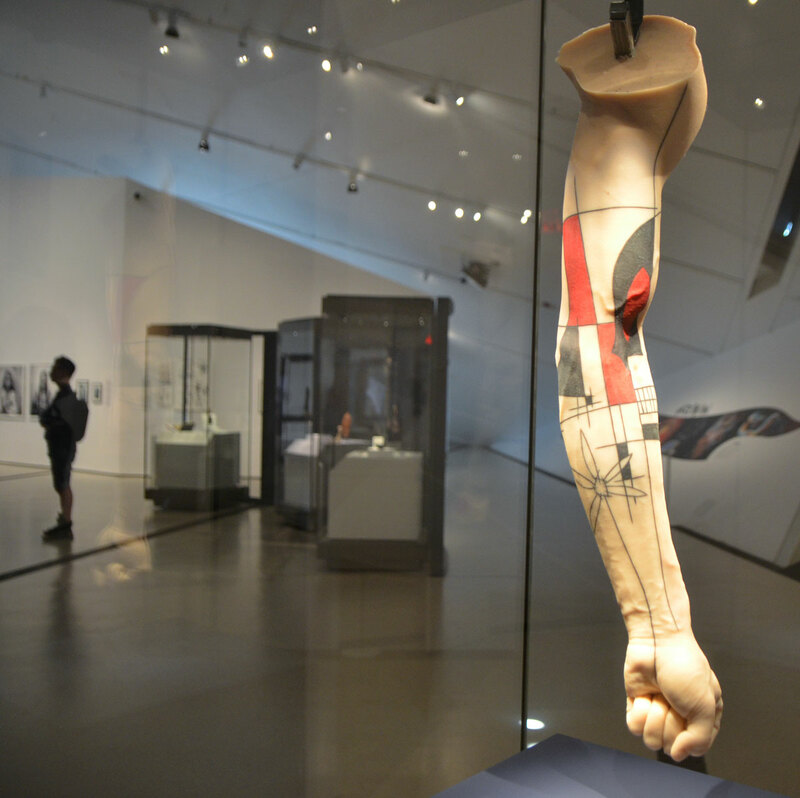 below: A silicone arm with a tattoo by Montreal artist Yann Black on display. This is one of 13 commissioned tattoos on silicone body parts – arms, legs and torsos both male and female that are part of the exhibit. Tattoos as artwork. Individuality. The oldest known tattoos were found on Otzi the Iceman, a natural mummy who was found in the Otzal alps near the Austria – Italy border in 1991. His tattoos were 61 lines ranging in length between 7 and 40 mm. The lines were arranged in groups. Most of his tattoos were on his legs where there were 12 groups of lines. Otzi is estimated to have died between 3239 BC and 3105 BC. Tattooed mummies have also been found in other places – Greenland, Alaska, Siberia, Mongolia, western China, Egypt, Sudan, the Philippines, and the Andes in South America. We will probably never know what significance the tattoos had. Theories abound of course and they often involve reasons like protection, spiritual, status, tribal, or just for decoration. Reasons that probably ring true today too. The methods have changed and some of the images have changed, but human nature remains just that, human nature.